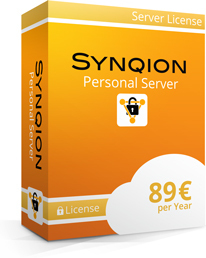 The Synqion Personal Server license included allows you to use one instance of the Personal Server. You can install the Personal Server on any server, on an NAS system or on a computer. This server merely has to be accessible by all clients, e.g. via Dyn-DNS or a fixed IP address. The Personal Server enables you to control which users are able to set up new Spaces in your storage area. You can use any storage space of any amount attached your server.